In a post-apocalyptic world controlled by alien invaders, two teens and a young girl with mysterious powers embark on a dangerous journey. What they find will change everything... Earth has been conquered. An extraterrestrial race known as The Assembly has abducted the adult population, leaving the planet's youth to fend for themselves. In this treacherous landscape, Holt, a bounty hunter, is transporting his prisoner Mira when they discover Zoey, a young girl with powerful abilities who could be the key to stopping The Assembly. 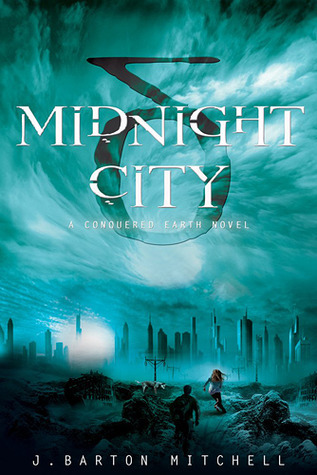 As they make their way to the cavernous metropolis of Midnight City, the trio must contend with freedom fighters, mutants, otherworldly artifacts, pirates, feuding alien armies, and perhaps most perilous of all: Holt and Mira's growing attraction to each other. I haven't heard about this one yet but, I am definitely adding it to my TBR list, Thanks for stopping by my blog and sharing! Wow I haven't heard of this one before but now I am totally excited to read it. Romance, adventure, AND a creative premise?!?!? This sounds like a book for me. And YES October is far away! My choice is also an October release...it looks like there are a lot of great October releases! Thanks for sharing. This is the first time I've heard about this book - but I don't read a lot of YA driven novels - but at the same time this really doesn't sound like a YA book - either way this does sound really interesting- good pick. Oh, gosh, this looks amazing! I can't believe I'd never noticed it before. Onto my tbr it goes. Thanks! I haven't really read any "post-apocalyptic" books but this one's premise sounds really good! I've really been into the alien scene lately so may have to try this book out when it comes out. Wow, this is an absolutely intriguing premise! Can't wait for this one, I'll be adding it to my wishlist right away! I stumbled across this one last week and instantly fell in love! I can't wait for it to come out.